Hostel Lodi v Řím, Itálie: Zarezervujte nyní! All the amount for the whole period will be charged. 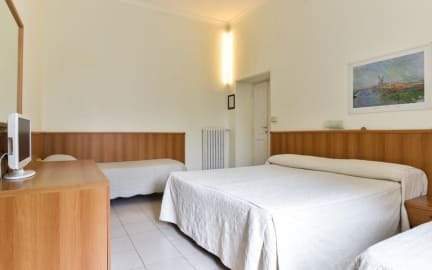 Hotel Lodi is located in the center of Rome in the district of San Giovanni; it is a short walk from the Basilica of St. John, the most important and ancient Basilica of the West, the cathedral of the Diocese of Rome, currently ruled by Pope Francis. Located in a beautiful area of the Eternal City, the Hotel is easily accessible from attractions and the most important monuments. 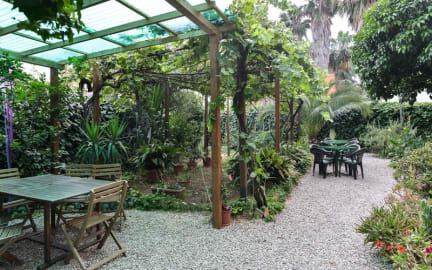 It is located in a building of liberty style architecture and features a garden with fruit trees and various plants and is the perfect place to relax, enjoy a delicious breakfast, read a book, or drink a glass of wine. Free Wi-Fi is available in the rooms and common areas; 2 computers are also available for free use in the common room which includes a selection of books specially dedicated to Rome and Italy. The multilingual hosts are available 24 hours to provide guests with all the information and useful tips for exploring the Eternal City. Support and guidance for booking tours or purchasing tickets for the many attractions available across Rome is also offered. Terms and conditions for cancellation and / or modification: We only accept changes or cancellations by email; if they are done 3 days before the day of arrival you will not be charged. After then, for changes or late cancellations, you will be charged (on the card received as collateral) for the first night. In the case of a no-show, you will be charged the full amount of the reservation. Hotel Lodi is authorized to pre-authorize the card. The spacious and comfortable accommodations offer private and common areas and are ready to welcome families, couples, friends, singles and groups. Please note for the dorms we only accept guests up to 50 years old and in case of reservation will be considered as a no-show upon arrival. The private rooms however have no age limit. The payment for dorms JUST in cash upon arrival.